We all know the tablet/e-reader market has been dominated by big names like Samsung, Acer, Google and others, but we have a new contender the Kobo. 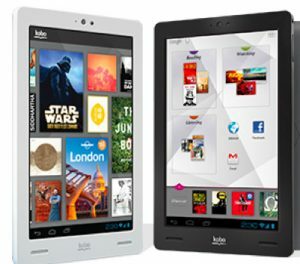 For readers that want it all, Kobo Arc is the ultimate 7” Android tablet at the perfect price. Perfected by Kobo’s exclusive interface Tapestries, Kobo Arc learns what you like and delivers more of the eBooks, music, movies and webpages you love. The light yet durable tablet with HD display brings your favorite photos and videos to life. Games and apps are driven by a powerful 1.5GHz dual-core processor. Stop searching and start discovering more of the things you love with Kobo Arc. Dimensions: 7.43in x 4.72in x 0.45in / 120mm x 11.5mm x 189mm. Display: 7” HD Display; 1280 x 800 resolution; 215 ppi; 16.4 million colours. Screen: IPS LCD – optimized for 178 degree viewing angles; ultra-durable glass resistant to damage, scratches, bumps and drops. Connectivity: Wi Fi 802.11 b/g/n , Micro USB and WiFi Direct. Camera: 720p HD 1.3 megapixel forward-facing camera. Sensors: Accelerometer, ambient light sensor. Colours: Available in black or white. Two interchangeable backs are Available for purchase: Blue and Purple. Arc OS: Enjoy Google’s open Android 4.0 platform to customize your device to suit your tablet needs. Google Play: Access more than 600,000 apps and games from the Google Play Store. Tapestries: Build Tapestries based on your interests and the content you love to easily organize your tablet. Discover: Kobo Arc intelligently recommends new eBooks, videos, music and more based on the content you “pin” to your Tapestry. Bookstore: Nearly 3 million books, newspapers, and magazines. Over 1 million free titles. Kobo Everywhere: Kobo eBooks are stored safely in the cloud – retrieve them at any time. Bookmarks and settings are seamlessly synced across all Kobo eReading apps and devices. Social Reading: With Reading Life and Kobo Pulse, track your Reading Stats and share what you’re reading, favorite passages and Reading Life awards to Facebook and Twitter. Notes, Quotes: Highlight text, type notes, share to Facebook & Twitter. Preloaded Apps: Facebook, Twitter, and Skype. Stream music from 7Digital and Rdio, access magazines and newspapers through Zinio and PressReader. Google apps include: Google Play, Gmail, YouTube, Google Maps, StreetView, Calendar, Contacts, Google+ and Google Chat. Advanced Features: Use WiFi Direct to stream multimedia content to your TV with a compatible A/V adaptor. Enjoy all Android customization features such as resizable widgets and face unlock. Languages: English, French, German, Spanish, Portuguese, Dutch & Italian. File Types: Books: ePUB, including fixed layout and enhanced ePUB. Images: JPG, PNG, GIF, BMP, WEBP. Audio: MP3, AAC, 3GP, MP4, M4A, FLAC, OGG, WAV, MID.